Remember when the Middle East was supposed to explode in December 2017, after President Trump recognized Jerusalem as the capital of Israel? Much of the Western foreign-policy establishment, and the journalists and commentators who echo their views, predicted a regional meltdown—riots in the streets, American diplomats in danger, Israeli-Palestinian peace deader than dead. And yet, life continued in the Middle East as it had the day before Trump's announcement. There were protests and a few isolated instances of violence, but nothing more. Much of the region was of course on fire, but only because that is the tragic status quo. Fast-forward 15 months, and the same voices are calling for another catastrophe in the Middle East, again due to a decision Trump made about Israel. "After 52 years, it is time for the United States to fully recognize Israel's sovereignty over the Golan Heights," Trump tweeted on Thursday. 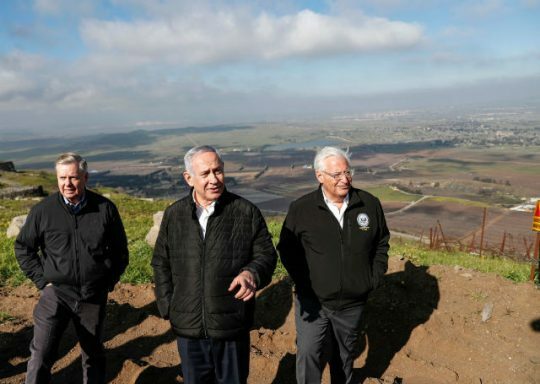 The president's decision to endorse Israeli control over the Golan, a strategic region on Israel's northern border previously controlled by Syria, immediately drew criticism, despite having bipartisan support. "Trump's Golan tweet inflames regional tensions as Syria vows to recover the strategic plateau," read one headline in the Washington Post. The move "damages Israeli security and undermines American interests in the Middle East and beyond," argued two experts, who also predicted more chaos. As with Jerusalem, all the tension and chaos will be little more than the same anti-Israel—and in most cases anti-American—regimes in the Middle East making the same threats that they make normally, regardless of what Trump tweets about the Golan. Trump's decision is simply recognizing reality. Israel captured most of the Golan Heights from Syria during the Six-Day War in 1967, when the Jewish state took military action in self-defense. The Arab world, led by Egypt's Gamal Abdel Nasser, sought Israel's destruction and was planning a war to realize that dream. So Israel did what anything with self-preservation would do: protect itself to ensure its survival. Following the war, the United Nations Security Council adopted Resolution 242, which called for the "withdrawal of Israel armed forces from territories occupied in the recent conflict." Israel tried to negotiate with the Arabs, even thought the text (which has no legal force) did not say that the Israelis had to withdraw from all the land they captured. The Arab League responded with what became known as the "Three Nos:" "no peace with Israel, no recognition of Israel, no negotiations with it." In 1981, Israel annexed the Golan, triggering international condemnation. Many observers saw—and continue to see—the region as Syrian land occupied by Israel. Still, since the annexation, Jerusalem brought up plans to withdraw partially from the territory during several rounds of peace talks with the Syrians, who never accepted any of the proposals. Israel's thinking changed in 2011, when the Syrian conflict began. Iran deeply entrenched its forces and its proxies in Syria, while Sunni jihadist groups like the Islamic State spread throughout the country. Israel recognized the obvious reality: if Syria regained control of the Golan, the Jewish state's worst enemies would be in prime position to attack. With its strategic line of volcanic hills, the Golan gives Israel an absolutely essential topographical advantage. Moreover, Mount Hermon provides the Israeli military critical intelligence. Ceding the Golan to Syria now would be suicidal, allowing the likes of ISIS and Iran to target tens of thousands of Israelis. To sum up, Israel has controlled the Golan for 52 years, and anyone with half a brain understands that no Israeli government will ever give up the territory. So Trump's decision changes nothing; it just puts a stop to any delusional notions that the United States would pressure Israel to cede the Golan. There are only two options here: Israel gets the land, or Syria does. And Syria's leader is a savage beast who has slaughtered some 500,000 of his own people and displaced millions more. Oh, and he supports terrorism and some of the West's most hardened enemies. Israel, meanwhile, has taken advantage of the Golan's rich farmland and created lovely communities there, some of which are known to produce good wine. So why is this issue controversial? It is literally a choice between life and death. Since Trump's tweet, there have been only two valid arguments against his decision that warrant serious consideration. Hussein Ibish, a scholar at the Arab Gulf States Institute, makes the first one in Bloomberg. "If the U.S. endorses Israel's annexation, the principle of the inadmissibility of the acquisition of territory by war—the most important principle of the U.N. charter—will be gone," he writes. "Confirming Israel's seizure of this territory would render any territory in the world subject to conquest and annexation. There'd be no legal basis to insist, for example, that Russia must return Crimea to Ukraine." The argument is sound in general, but wrong in this specific circumstance. Israel waged a defensive war in 1967, fighting for its own survival. In fact, Syria attacked Israel. And, as Eugene Kontorovich, a professor of law at George Mason University, has noted, international law does not forbid countries from keeping territory that they gained in such wars of self-defense. Think about it: if the opposite was true, then international law would encourage belligerent states rather than deter them. Furthermore, Russian President Vladimir Putin did not need any justification for seizing Crimea. He just took it, and unlike Israel, he did so in a war of aggression. The two situations have fundamental differences. It is hard to imagine that other countries will suddenly begin invading their sovereign neighbors and hold up a printed version of Trump's tweet while shouting, "See, we are allowed to do this now!" The second argument, which some nuanced observers have made, is that there is no need for Trump to endorse Israeli sovereignty over the Golan, and thus trigger the backlash that comes with it, at this time. The move may be right (or not), but just wait for another day, perhaps when the region is not already so chaotic. Fair enough, but people will be making this argument until the end of time, continuously delaying a decision. Moreover, the logic is not strong enough to overcome the fact that the United States needs to make a statement that will deter Israel's adversaries from trying to conquer the Golan. For decades American presidents have refused to recognize Israel's sovereignty over the Golan Heights. On Thursday, Trump made the right decision to change that. Sure, there will be some shouting in protest—Syria, Iran, and Hezbollah are not too happy. After all, American recognition makes their war against Israel just a little bit more difficult to wage. Beyond that, the Middle East will remain the same, as it did after Trump recognized Jerusalem as Israel's capital. True, much of the region will be in flames tomorrow, but, tragically, it would have been even if Trump never sent that tweet. This entry was posted in National Security and tagged Israel, Middle East, President Trump, Syria. Bookmark the permalink.